The internationally-acclaimed forensic institution has adopted L-Tron’s OSCR360 crime scene investigation equipment for student field training. L-Tron is proud to announce that OSCR360 was purchased by the Henry Lee Institute of Criminal Justice and Forensic Sciences. 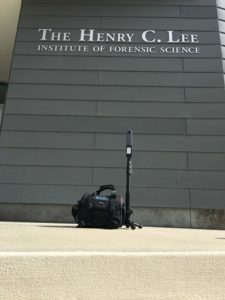 The Institute recently acquired L-Tron’s OSCR360 Crime Scene System for instructional use in its college-level forensics curriculum after an OSCR was shown to founder and world-renowned forensic scientist, Dr. Henry C. Lee. Dr. Henry Lee is the former director of the Connecticut State Police Science Laboratory, Connecticut state’s former chief criminalist, and has authored and co-authored hundreds of academic publications and books. Dr. Lee’s resume boasts over 8,000 criminal cases in dozens of countries across the globe, including notable, high-profile American cases such as O.J. Simpson, JonBenet Ramsey, and a review of the John F. Kennedy assassination. His knowledge and expertise is highly sought after and he has consulted with over 600 law enforcement agencies worldwide and provided expert testimony in the courtroom on thousands of occasions. For over 35 years, The Henry Lee Institute has continued to teach Forensic Science to undergraduate and graduate students. In addition, the Henry Lee Institute staff travel around the world teaching Law Enforcement the most current Forensic Science practices. The Institute intends to use OSCR360 primarily for training at the institute. Since its inception, OSCR360 has gained the attention of crime scene investigators and law enforcement officials by organizing, containing and preserving all digital evidence related to a case. OSCR captures entire crime scenes within minutes, preventing detrimental scene contamination, preserving fleeting outdoor evidence (footprints, tire tracks, etc) and enabling command staff to be well-informed from outside the crime scene. The camera easily photographs small, cramped spaces as well, such as bathrooms, closets and the inside of a vehicle. The software ties pieces of evidence to the overall scene, connecting the dots for investigators and those involved in the case. OSCR360 is catching on in more avenues than just crime scene investigations. L-Tron started out in the Law Enforcement space and users saw many other applications. OSCR has grown into a powerful multi-purpose tool for: crime scenes, fire investigations, crash scenes, courtroom presentations, emergency pre-planning, campus security, active shooter pre-planning, environmental conservation, HAZMAT, bomb squads, hospitals, code compliance, infrastructure documentation, clandestine drug lab investigations, and more. Questions? Interested in learning more about L-Tron’s OSCR360 Solution?